Garden decking is currently going through a renaissance, seen in abundance at this year’s Chelsea Flower Show and in many garden designs. As a relatively inexpensive and easy way to create an outside entertaining area, garden decking is an excellent choice. Since it first became popular in the 1990s as a result of TV garden makeover shows, garden decking has been revolutionised. As well as standard, treated softwood, customers now have a choice of both timber decking and composite decking, all available in a huge range of materials and patterns. So which is best? Manufactured using recycled plastic and sawdust, composite decking is a low-maintenance, durable type of decking with excellent environmental credentials. Built for longevity, composite decking will never rot or split, does not need oiling or painting and is easy to install with its very own fixing system. Trex is a leading manufacturer of composite decking and its products come with a guarantee of 25 years for residential use and 10 years for commercial use. This means that Trex does cost more than standard timber decking, but the benefits of a 25 year guarantee still make it an attractive prospect. Traditional softwood treated decking is still extremely popular. A natural product, timber decking looks great, is inexpensive and can be very long-lasting if properly maintained. Although regular maintenance is needed to keep it looking great, timber decking can be stained or painted to a colour of your choice or left to weather to a natural silvery grey. It’s all about personal preference. If you are leaning towards timber decking, it’s worth considering anti-slip decking, which is now widely available and excellent for high footfall areas, steps, edgings or even whole decks. This treated timber deck board has anti-slip material inserted into its grooves, which is discrete whilst still achieving high levels of safety. One other thing to look out for when choosing timber decking is an FSC or PEFC certification – an assurance that the timber comes from a sustainable forest. In recent years, there has been an increase in customers requesting a whole range of timber species, from durable softwood timber such as Western Red Cedar and Siberian Larch to sustainable hardwoods like Ipe and Cumaru. Modified timber products like Accoya are also becoming popular, as their unique properties make them highly durable and resistant to rot. 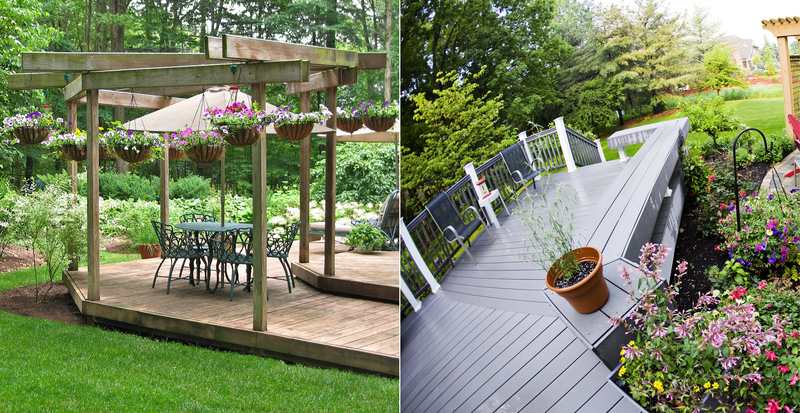 With this in mind, there is no obvious winner between composite decking and timber decking. Both have clear benefits, therefore the decision rests with personal requirements, preferences and budget.